Tempers flared –as punches, kicks, and water bottles flew – in Monday night’s Australia-Philippines face off in the FIBA World Cup Asian Qualifiers held at the Philippine Arena. 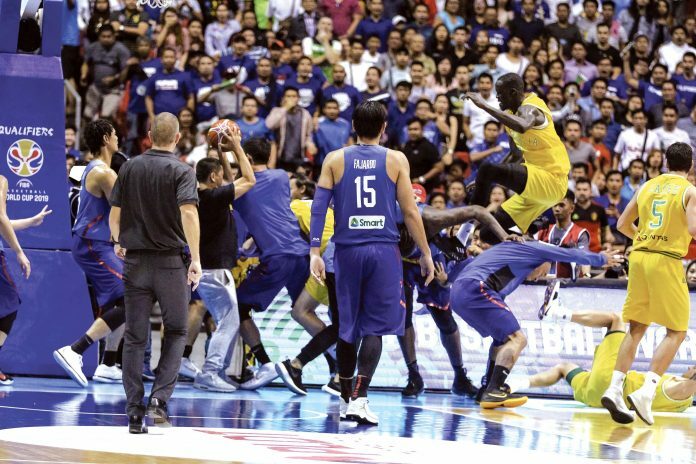 And one of the key figures in the bench-clearing melee between the Boomers and Gilas Pilipinas’ last game in the first round qualifying battles was Thon Maker, the 7-foot-1 center who narrowly missed hitting Terence Romeo with a kick as players from both sides engaged in a free-for-all. The South Sudan-born Maker took to Twitter hours after the ugly incident and expressed his disappointment for his role in the fracas that resulted in four Australian players and nine Pinoys to be slapped with disqualifying fouls. “I am deeply disappointed in the actions displayed during yesterday’s game against the Philippines. Being from a war-torn country, basketball for me has always been a means to bring people together,” the 21-year-old Maker, who plays for the Milwaukee Bucks in the NBA, said in his statement posted on his official account. “I take responsibility for my actions, knowing that they were a result of my desire to protect my teammates and myself. It is a tremendous honor to represent Australia, the Milwaukee Bucks, and the NBA and my goal is to reflect that in my conduct and my play,” he added. With 4:01 to go and the Boomers with a 79-48 advantage over Gilas, the heated match came to a halt after the Philippines’ Roger Pogoy and Australian veteran Chris Goulding collided that eventually led to players from both squads rushing to the defense of their respective teammates, dishing out punches and kicks. After almost an hour of deliberation by game officials, play resumed with just three players – June Mar Fajardo, Gabe Norwood, and Baser Amer – left to play on for Gilas Pilipinas. Fajardo and Norwood soon fouled out leaving Amer as the last man standing for the Philippines. The game officially ended with a little less than two minutes left in the quarter as Australia seals a 89-53 win by default and the top spot in Group B. The International Basketball Federation, meanwhile, will start a probe on the unfortunate incident as announced on its official Twitter account. Following the incident that occured in the third quarter of the Philippines-Australia game on Monday in the FIBA Basketball World Cup 2019 Asian Qualifiers, FIBA will now open disciplinary proceedings against both teams. The decision(s) will be communicated in the coming days.